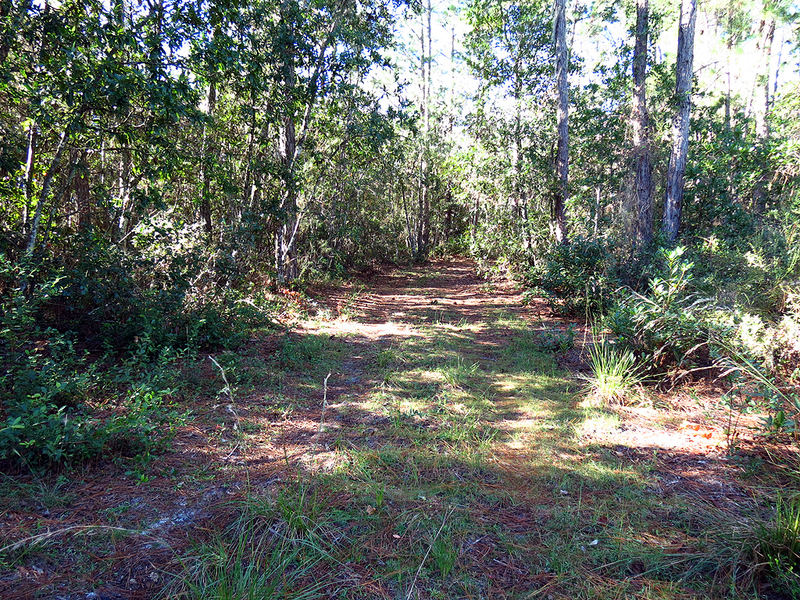 This conservation/nature area is owned and maintained by Osceola County. It is comprised of 984 acres with several Eco-Systems. There are two distinct trailheads. One is located off of Bass Road for access to the North Loop. The second is located off of Old Melbourne Highway for the WP Tyson Trail Head. 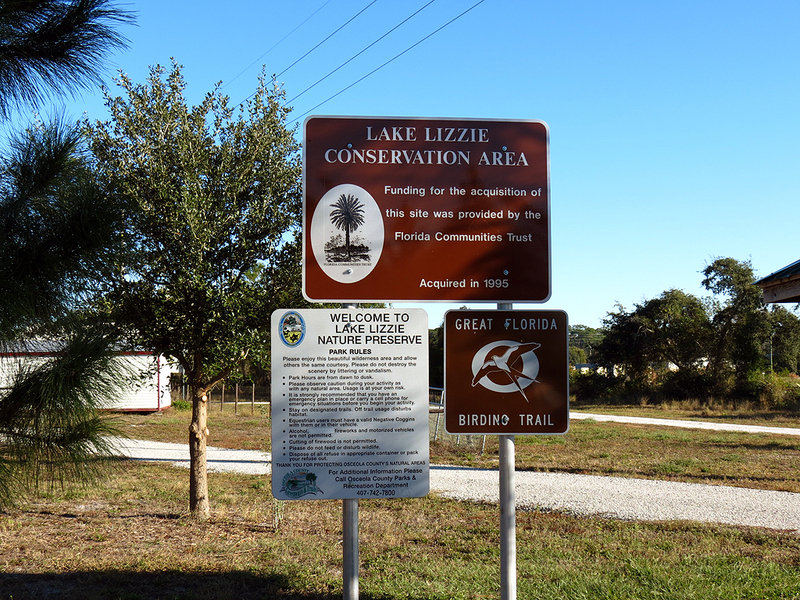 The WP Tyson Trail Head will give you access to the Marsh Loop and the Lake Lizzie Loop. On the Kiosk the write-up for the area states there are 14 miles of natural trails, 6 miles of which are marked. They do not actual use “blazes” to mark the trails, but instead use signs. 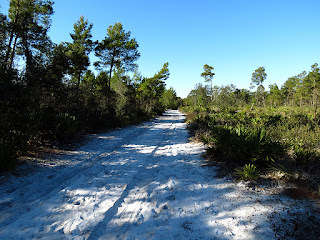 The trails in most cases are mainly just old rustic roads that nature has reclaimed; some are quite sandy and can be a little tough on the calves. The parking area off of Old Melbourne Highway is very nice, with even a restroom. It is a fine place to start and end your hike. The parking area off Bass Road was just a grassy pasture the day I hiked there. They do provide a picnic table and an information station at that location. You can access the whole area from either parking location. I recommend enjoying the southern section of the conservation area from the Old Melbourne Highway parking area and then using the Bass Road parking area to experience the the northern loops. I first visited the southern section of this conservation area. There is a very nice parking area located right off Old Melbourne Highway. The county has provided two information stations at this location. This certainly was designed to be the main access to the Lake Lizzie area. There are two trailheads located here. You can elect to venture out on either one; both will take you on loop trails, which in most cases are just old roads. The scenery is very nice, you will encounter open scrub land, scrub pines and oak forests as you venture along the trails/roads. 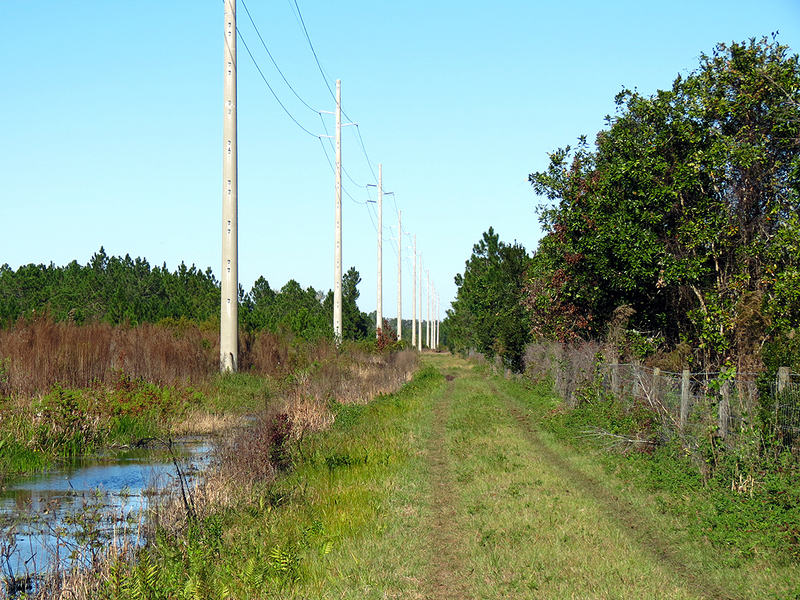 The Lake Lizzie Trail will take you out to the powerlines, then along the edge of the conservation area, along private property. You will see Bay Lake through the trees from the trail; if it is dry enough you can venture over to the lakes edge once you pass by the private property. At any time you can find a trail/road which will bring you back to the parking lot if you so wish. 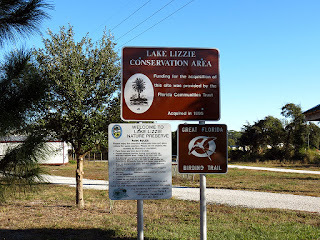 Once you hit the powerlines again, you can venture up that road until you find the branch off which leads to Lake Lizzie and the picnic areas provided by the county. 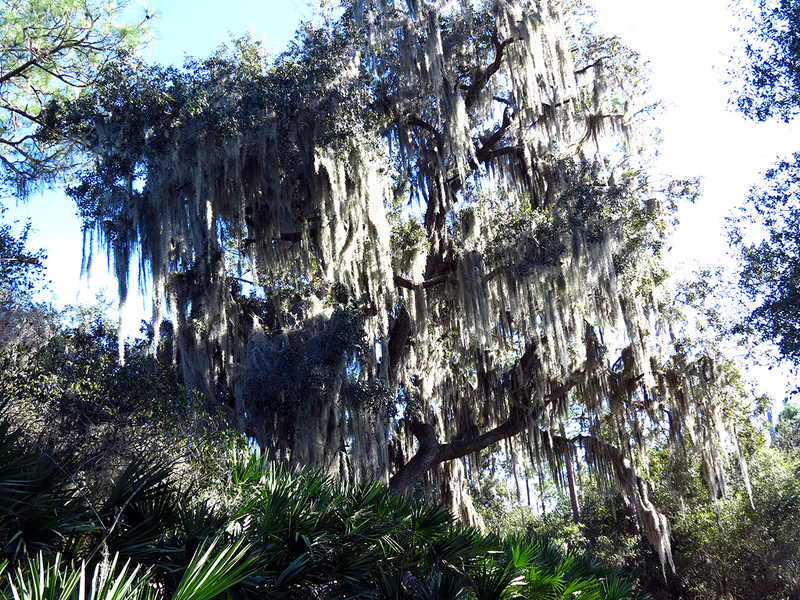 The Lake Lizzie area is very pretty, with some beautiful oaks, some covered in spanish moss. You can venture down to the lakes edge, even getting your feet wet if you so desire. As with any lake in Florida, there could be a big alligator lurking in the water weeds! The picnic area is quite extensive, some sections are covered while others are open. A restroom is located here. I recommend that you plan a day visit to the conservation area and keep this area in mind when you break for lunch. From the picnic area you can elect to explore additional sections to the north or find one of the other trails/roads which will take you back to the parking area. As I’ve mentioned before, many parts of the trails/roads are sandy, so it can be a little hard on the lower legs after a while. Also on a sunny day the white sand reflects the sun and that can drain you also, bring plenty of liquids. 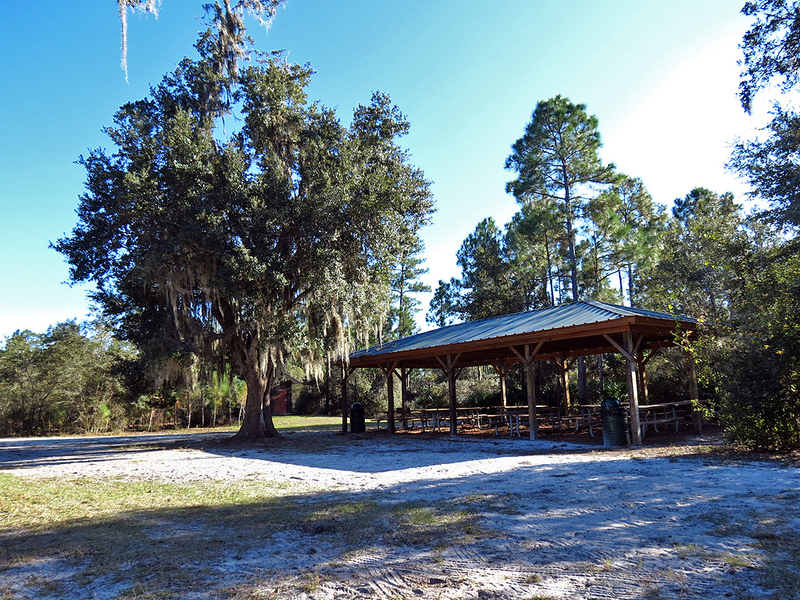 You can elect to take the Marsh Loop Trailhead from the parking lot (west end of parking lot). This trail/road will take you to another eco-system, which I’m sure you will enjoy seeing. As with other parts of the conservation area, if it is the wet season, some areas might not be assessable. Visit the area in both the wet and dry seasons to get a look at seasonal Florida. The day I visited the conservation area I elected to drive up to the northern parking area off Bass Road to get a look at that section. The parking area off Bass Road is just a big field, with an information station and a picnic table. Nothing fancy there when I visited the area in Dec 2011. There is one entrance to the conservation area. Once into the area you can elect to venture down any trail/road you desire. If you elect to go east, you will pass through a beautiful pine forest which will take you to the powerlines. You can follow the powerline road north, where you will get some views of Trout Lake to the west. Further up north you will encounter some more scrub areas. I enjoyed this section very much. You also can head west, along a sandy trail/road, through a true Florida scrub! The trail/road will eventually take you to Lake Lizzie, where you will find a nice oak/Spanish moss area. There are some views of the lake itself. If you follow the trail you will come to the main picnic area provided by the county. The trail will loop back to the parking area, so consider just following it. 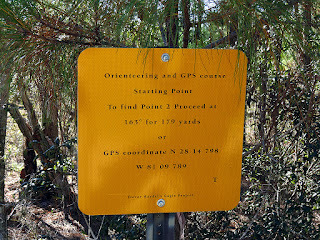 There is a very interesting orienteering and GPS course created by Eagle Scout Trevor Haydel located just inside the conservation area’s Bass Road parking area. What he has done is to create a course that you can use either a compass or a GPS to follow. You will find the first sign at N28 14.885 W81 9.811 – from there you must find each of the next sixteen points. It is an excellent way to gain experience using either a compass or a GPS unit. I believe everyone who ventures out into this type of area should carry a GPS unit. I thank Trevor for his excellent idea and his superb way of presenting it. The course will be there for a very long time – give it a try! In order to enjoy all aspects of the conservation area, I suggest you make a few trips. You should park at the Old Melbourne Road parking area a few times and the Bass Road parking area at other times. You will find it a convenience to access the same areas from both parking places at times, no big problem. The day I hiked the areas I didn’t see any wildlife, but I’m sure they are lurking just out of sight because it is a no hunting conservation area and that normally means an abundance of wildlife. There were a few wildflowers, but not that many – certainly disappointing for me. Thank you for this informative and accurate description!